[INQ. NO. 1508M23] Established in 2009, AUROS Technology is the world’s leading provider of overlay metrology systems in the semiconductor industry. With more than worldwide 80 employees and 60 R&D engineers, the company continues to focus on technical improvements and solid partnerships with customers. In 2011, AUROS Technology merged with ERI Co., Ltd. which manufactured LED PSS inspection systems. Then, IMT Corp. was incorporated in 2012 as a subsidiary of AUROS Technology and succeeded in exporting OL-300n to Wuxi, China. The OL-600n, released in 2003, is an overlay metrology system with unique and innovative technologies. 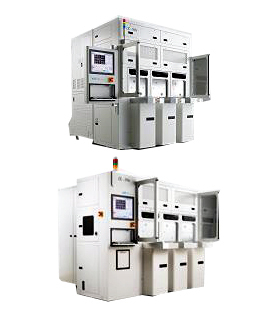 The system verifies the improper array of patterns during manufacturing process of semiconductors. Production of such equipment has allowed domestic firms to become less reliant on exports. AUROS Technology received awards including ‘IR52 Jang Young Sil’ by the Ministry of Science and Technology, and ‘World-Class Products of Korea’ by the Ministry of Trade, Industry & Energy. The OL-600n provides optimum performance for the 2X/1Xnm nodes. The systems offers enhanced precision, TMU (Total Measurement Uncertainty), and MAM (Move-Acquire- Measure) time, compared to the previous model of OL-300n. The system has also integrated EUREKA Ⅱ, which is an advanced inline data analyzer that enables users to collect data of variation monitoring and analysis in a user-friendly manner. In addition, OL-600n has a smaller platform than OL-300n, which delivers increased utilization of fab space. Established in 2009, Auros Technology is the world’s leading provider of overlay metrology systems in the semiconductor industry. With more than worldwide 80 employees and 60 R&D engineers, the company continues to focus on technical improvements and solid partnerships with customers. In 2011, Auros Technology merged with ERI Co., Ltd. which manufactured LED PSS inspection systems. Then, IMT Corp. was incorporated in 2012 as a subsidiary of Auros Technology and succeeded in exporting OL-300n to Wuxi, China. The OL-600n provides optimum performance for the 2X/1Xnm nodes. The systems offers enhanced precision, TMU (Total Measurement Uncertainty), and MAM (Move-Acquire-Measure) time, compared to the previous model of OL-300n. The system has also integrated EUREKA II, which is an advanced inline data analyzer that enables users to collect data of variation monitoring and analysis in a user-friendly manner. In addition, OL-600n has a smaller platform than OL-300n, which delivers increased utilization of fab space.